The LakeView RecPlex, located inside Prairie Springs Park along the shores of scenic Lake Andrea, announced a second major expansion in 2008: a 13,000 sq. ft. 50-meter competition pool, the serious swimmer’s pool of choice. Made possible through a community focused partnership with ULINE, Inc., the 42,000 sq. ft. expansion to the existing center includes the competition pool, related amenities, and seating for approximately 600 spectators to cheer on the team. Two bulkheads divide the pool into three sections for lap swimming, aquatic programs, and competitive swimming. For lower operating costs, water in the pool and air in the natatorium are heated and cooled through geothermal technology, utilizing the adjacent Lake Andrea. With this latest expansion, the total size of the facility is now over 302,000 sq. ft., including the IcePlex, a fieldhouse, fitness center, indoor waterpark, and multi-purpose rooms. 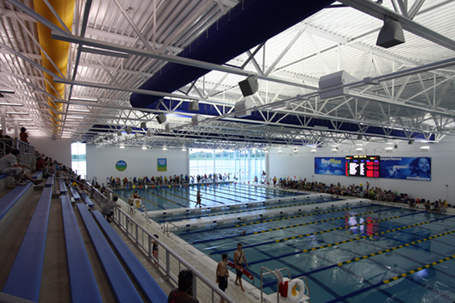 The RecPlex Aqua Arena was dedicated to the citizens of the Village of Pleasant Prairie on June 10, 2010.